I am currently involved in a couple of projects that require tracking my diabetes data. The good part is that some of the data is automatically logged with little or no input from me. The bad part is that I am using 3 different apps on my phone and must enter food information twice. The good part is that I have learned new things about my diabetes. The bad part is that I am uber-involved in the input of data and not paying much attention to the output. Most of you are familiar with the Big Blue Test sponsored by the Diabetes Hands Foundation. Every test logged between October 14 and November 14 will result in a $3 donation to support people with diabetes. Three charities will receive $5000: Diabetes Sisters, We Are Diabetes, and the Riverside Community Diabetes Collaborative. The Big Blue Test is by far the easiest of my current data projects. I use the app on my phone and it’s a quick 30 seconds to record my exercise. Although participation is easy, I am no Big Blue Test slouch. Yesterday I managed to input 5 (!) tests. Dog walk. Gym session. Rake. Rake again. Dog walk. That translates into a $15 donation for diabetes. If you are participating in the Big Blue Test, keep up the good work. If you are not involved, check out this link to learn more. It’s not just walking and running. You can include housework, yard work, weight work, and dancing. You can help a couple of diabetes groups while receiving the physical and mental benefits of moving your body. Sounds like a win for all. I continue to be a beta-tester for the mySugr consulting module. As outlined in my September post, mySugr is launching a feature to allow virtual coaching from Gary Scheiner and the team at Integrated Diabetes Services. You can learn more about the program here and here. Today I am not addressing the coaching experience except to say that Gary Scheiner does a better job of understanding my D-data than I do. Instead I am writing to share that amazingly I am still logging after 3 months! I am still learning shortcuts for entering my data and have reduced the number of data points I am tracking. I continue to enter food and carb counts, but don’t classify the food anymore as vegetable, meat, etc. Similarly I am not distinguishing between food and correction bolus amounts, just total insulin. What I like about mySugr is the ability to customize my logbook to show only the data points that are important to me and to list them in an order that makes sense to me. My newest “cool” discovery about mySugr is that if I use the workout app on my Apple Watch, it automatically transfers the activity to mySugr. Another diabetes/life datapoint automatically logged! Glu is the patient community of the T1D Exchange and provides an easy way to participate in research relating to type 1 diabetes. I am currently part of a study about blood sugar results and treatment satisfaction for T1 adults using pumps or multiple daily injections. The logging requirements of this study are not difficult because most of my data goes into Tidepool’s Blip. If you don’t know about Tidepool and their innovative diabetes apps, check it out here. I download my Animas pump and Freestyle meters once a week. My Dexcom CGM automatically links with the Blip Notes app on my iPhone. My only daily responsibility is to create a Blip note whenever I eat. I click on #food and record the meal with the carb count. To make it easy, I copy and paste the meal info just entered into mySugr. Takes 30 seconds or less. The Big Blue Test ends November 14. The mySugr logging has no end date and I’ll keep at it a while longer. But not forever. The T1D Exchange study lasts 4 weeks. I have learned a lot from this intensive logging. I tend to eat a little bit all of the time and now have visual proof that my BG is better when I eat more at meals and reduce snacking. I have done some basal testing and am seeing better CGM tracings. Better basals allow for less snacking. But I am tired of logging. My head is exploding with numbers and my brain is drowning in data. I am thinking about diabetes too much and will be happy to quit recording my life in a couple of weeks. Being a diabetes data machine is fine for a while, but for me the benefit gets lost when I do it too long. For sure I will quit before Thanksgiving because there is no way I want to start the holiday season being accountable for my food decisions…. November is a month of change in Minnesota. We move from the somewhat warm days of late October to cold wintry weather by the end of the month. It is also a busy month for me when it comes to diabetes. 1) It is Diabetes Awareness Month with special events and increased advocacy. 2) JDRF sponsors a TypeOneNation Summit in the Minneapolis area. 3) My diaversary is in November. 4) The Big Blue Test is in full swing and World Diabetes Day is coming soon. I have been raking for a few weeks now, but one maple tree refuses to shed its leaves. Our last leaf pick-up is Friday and I am hoping that these leaves will drop before then. If that doesn’t happen, my fingers are crossed that strong winds next week will blow the delinquent leaves into my neighbor’s yard…. The signage at Hyland Lake Park Reserve where Abby the Black Lab and I walk several times a week has changed in anticipation of winter. The trail labeled for dog walkers, bikers, and rollerbladers in the summer is now marked for dog walkers and snowshoers. Although I shudder at the idea of snow, we have already seen flurries this fall. Once it gets colder, the snowmaking machines in Hyland Park will start blowing snow for the nearby cross-country ski trail. Although I live in the suburbs, I can see downhill and cross-country ski trails from my house. Just barely out of sight is a 70-meter ski jump. And you wonder why I spend my winters in Arizona! An apple on the ground and you question why I am showing you my garbage. My neighbors have apple and crabapple trees and fruit litters my backyard. The fruit-eating animals I have seen in the last week include coyotes, birds, deer, squirrels, and Abby the Black Lab. Who left the half-eaten apple? Probably Abby who really prefers deer poop. Yeah, we’ve got piles of that in the yard also. Diabetes social media has been saturated this month with blue photos as part of the JDRF T1D Looks Like Me campaign. I have a long history of hiding my diabetes, but thanks to my years in the DOC, I proudly share my photo. Saturday was the JDRF TypeOneNation Summit for the Minneapolis area. Author and CDE Gary Scheiner (Think Like a Pancreas) shared his wealth of knowledge in both the keynote talk and a session about interpreting CGM data. I also attended a talk by the incredible Jay Hewitt. Jay is an Ironman triathlete who was a member of the U.S. National Triathlon Team and raced with Type 1 diabetes. Don’t forget the Big Blue Test. Remember to follow the hashtag #WDDchat15 on Saturday, Nov. 14 to participate in the World Diabetes Day #DSMA TweetChat. The schedule can be found here, but stay tuned to @DiabetesSocMed on Twitter for updates. And finally, today marks 39 years since I was diagnosed with diabetes in 1976. This post is a mixture of important and not-very-important stuff. If you’re like me and getting tired of ‘heavy” and “try to change the world” issues, you might want to just read the last section which deals with autumn colors and burned-out lightbulbs. November is coming soon and I need to re-energize myself when it comes to diabetes advocacy. I will — because diabetes never takes a vacation. The hashtag #DOCASKSFDA has been everywhere in the diabetes online community recently. On November 3, 1-4pm EST, the FDA will host a live webcast that will feature a panel of people with Type 1/Type 2 diabetes along with representatives from ADA, JDRF, and diaTribe. Please fill out the short survey created by diaTribe to share your thoughts on important concerns for people with diabetes. The survey deadline is tomorrow, Oct. 21, so don’t delay. Your voice is important! You can learn more about the virtual conference at diaTribe. Most of us try to live a healthy life. Yeah, we make some bad decisions but we also do a lot of things right. I always think that it is funny how many of us share photos of post-doctor appointment cupcakes. Why do we work hard to prepare for medical appointments and then revel in “forbidden” treats afterwards? Are we just being healthy to impress our medical professionals? Beats me, but I always feel the need to “reward” myself after a stressful appointment or lab test. On Friday morning I had a lab test as a follow-up to my annual physical in September. Internet searches indicated that the rogue result in September could range from meaningless to cancer. I was worried. I stopped at Holiday on the way home from the test and purchased a Diet Coke instead of donuts. I have been working hard to reduce the presence of dark sodas in my life, so Diet Coke is on my try-to-avoid list. (Can you believe that I am still friends with Scott Johnson!!!) I have to admit that I don’t like Diet Coke all that much any more, but I still buy it because it has such happy and friendly memories for me. I got a call from my doctor’s office in the afternoon and fortunately my test was completely normal. The nurse who phoned indicated that they didn’t want me to worry about the results all weekend. My doctor earns an A+ grade for understanding how long a weekend can be when you’re worrying about medical issues. So far I have not had a great experience with long-lasting power-saving lightbulbs. My latest glitch was the rattling and sizzling demise of a $15 lightbulb. I put in another bulb and it died in a day or two. Being the electrical whiz that I am, I determined that I needed to replace the burned out socket in the lamp. A trip to the hardware store, a new socket, and a $20 LED bulb solved the problem. The new bulb is advertised to last 22.8 years and ultimately save me $231. I’ll be 84 years old when it bites the dust (unless it’s like the old one which only lasted a month). Mid-October is a colorful time in Minnesota. This photo was taken late last week on an early morning dog walk. Unfortunately strong winds and cold temperatures have resulted in a blanket of beautiful leaves in my yard. But one good thing: Raking counts as exercise for the Big Blue Test! 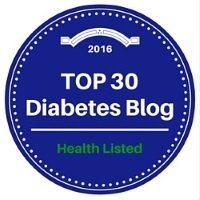 In recognition of November as Diabetes Awareness Month, Sue from Pennsylvania, Sue from New York and I have written blog posts for publication this week. 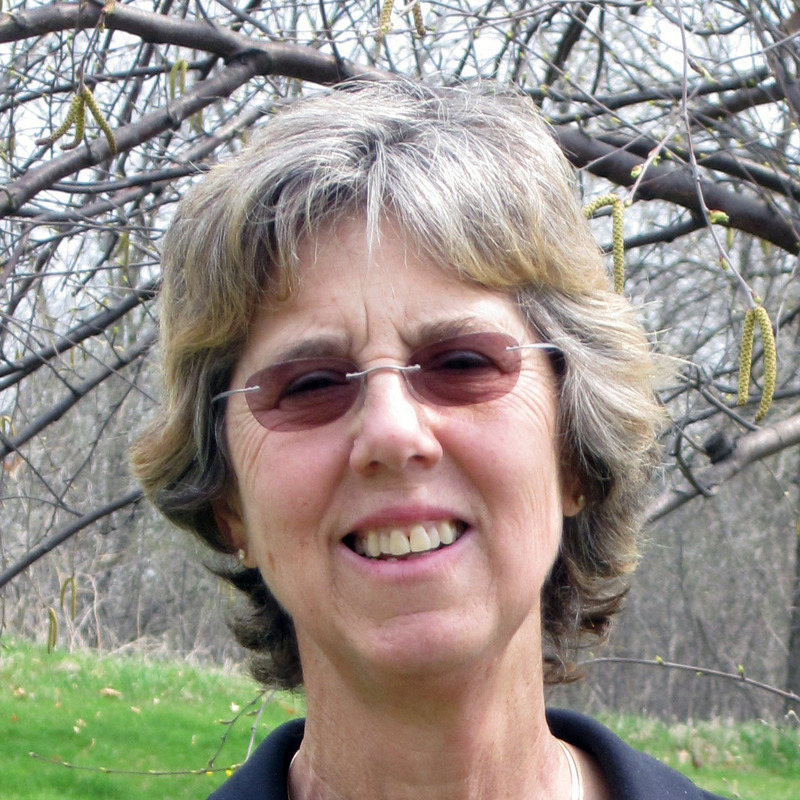 Sue from New York wrote about her appreciation for medical devices that keep her safe. As the spouse of a man with Type 1, Sue from Pennsylvania wrote about the importance of diabetes Awareness in November. Today I am writing about my November activities and my 37th Diaversary. 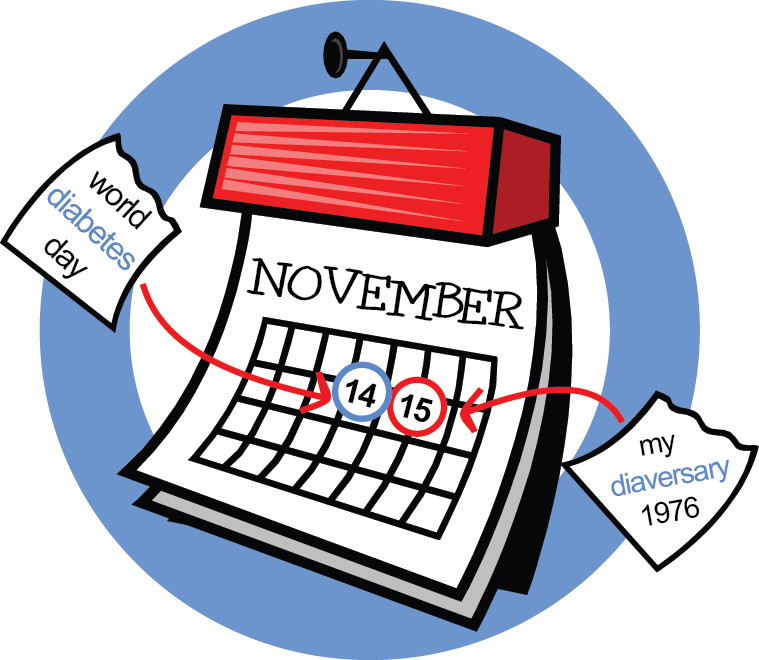 November is a busy month for the Diabetes Online Community (DOC). November is Diabetes Awareness Month(DAM), American Diabetes Month, or National Diabetes Month depending on whom you’re talking to. Regardless of the name, November is a month dedicated to increasing awareness of and advocacy for diabetes. On top of that, November 14 is World Diabetes Day, a campaign developed by the International Diabetes Federation (IDF) and symbolized by the Blue Circle logo. I have been impressed by the advocacy efforts of many of my fellow PWD (people with diabetes). Christel at theperfectd has spent the month being a Diabetes Awareness Month guide (a DAM guide about damn diabetes!) and writing daily informational posts about diabetes. Kerri at Six Until Me started the Diabetes Photo-a-Day project with a list of word cues for daily photos showing the life of someone with diabetes. George at Ninjabetic has been writing a daily tribute to special people in his diabetes world. Cherise from DCAF organized a 24-hour Twitter Chat on World Diabetes Day with a different host each hour. Cynthia at Diabetes Light has invited her readers to submit a quote and photo so that her blog can feature daily quotes by people with diabetes. I was honored to be asked by Cynthia to participate in her project and my quote, photo, and definition of success are featured on her blog today. I started the month with stress and guilt that I wasn’t doing enough for diabetes awareness and feeling left in the dust by my more ambitious fellow bloggers. By the time I realized that I should have considered doing an “everyday” project, I was well into the month and excused myself with the excuse that it was too late for this year. I do have a few ideas for next year. But then I compared myself to where I was a year ago. I started blogging in late May 2013 and along with my two co-bloggers, Sue from New York and Sue from Pennsylvania (actually three co-bloggers if you count Abby the Black Lab), have published at least two posts every week. For the first time in my life, I wrote letters and sent Tweets to my elected representatives regarding the Strip Safely campaign. For the second year I participated daily in the Big Blue Test. I tweeted in the DCAF 24-hour WDD Twitter Chat. 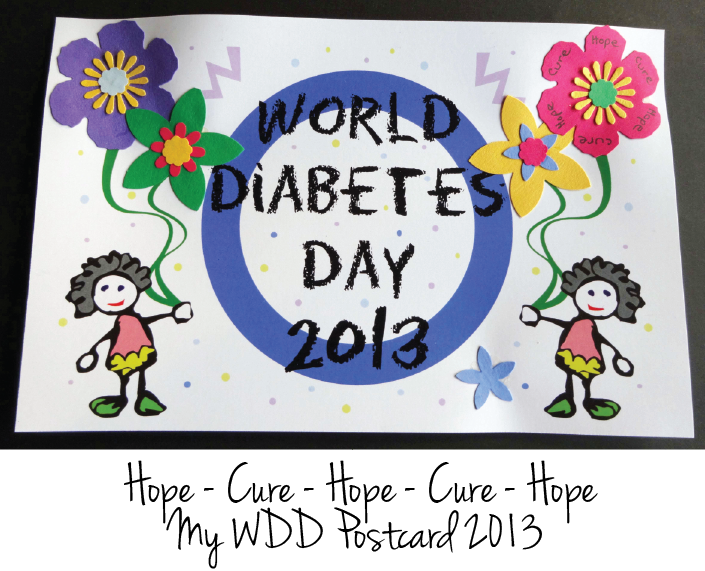 Even though I do not own a glue gun, I participated in the World Diabetes Day Postcard Exchange for the first time. I know that I am not a DOC leader for November activities, but I have been an active participant and I give lots of kudos for everyone’s efforts in promoting diabetes awareness in November. 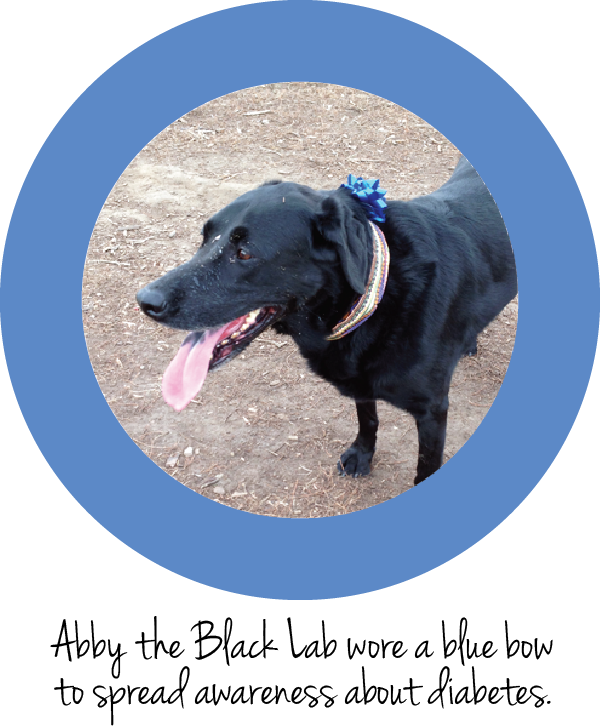 Abby the Black Lab was a diabetes advocate on World Diabetes Day. She wore a bright blue bow tied to her collar for our trip to the dog park. Interestingly enough, the first two people who asked about her bow had family members with diabetes but did not know about WDD. She educated at least 10 people about the importance of National Diabetes Month and World Diabetes Day. For better or worse, November has always been a special month in my diabetes life. Today, November 15, is my Diaversary. I was diagnosed with diabetes 37 years ago on November 15, 1976. I didn’t know the exact date until a few years ago when I decided to register with the Joslin Medalist Program. Luckily my local hospital was able to provide me with my medical records which were stored on microfiche. I had many vague memories of my diagnosis and they were backed up by the hospital records. So Happy Diaversary to me. After 37 years of Type 1, I rejoice to be living a healthy life with no major complications of diabetes. I rejoice that I am part of the DOC which provides me with daily friendship, support, and inspiration. I thank every one of you for the fabulous things that you do to improve the lives of everyone with diabetes. I am proud that my life has intersected with yours, although I wish that none of us had to deal with diabetes. Every day I continue to learn and grow. I hope that I can continue to say that until I have earned my Joslin 50-year medal and maybe my 75-year medal. To everyone in the DOC and to all of my family and friends, I hope that I have been able to give you at least a fraction of what you have given me.